This section contains publications about InstaForex Company released in print and online all over the world. Numerous articles dedicated to the activities of InstaForex international broker indicate the interest of mass media and their audience to our company. We seek to be as open and transparent to mass media and the consumers as possible. If you represent mass media and are interested in information about InstaForex Company or first-hand professional comments about Forex from its player, please visit Journalist's inquiries page. The global community has witnessed game-changing events in 2016. The shocking Brexit vote at the UK referendum and the victory of underdog Donald Trump triggered dramatic market moves including the forex market. The pound sterling sank to a historical low, the euro limited losses, and the US dollar skyrocketed, defying investors´ expectations. Interestingly, against the background of crucial changes in the global economy and nonstop developments on Forex, there is something unaffected by global turbulence. For instance, profits of InstaForex clients. It is common knowledge that a trader can grab a chance to earn fat profits from fluctuations of currency exchange rates. InstaForex offers clients a real informative hub containing a great deal of information such as news updates, surveys, and exclusive analytical reviews. We are living in the time of game-changing news and a vast non-stop flows of information, which we are carefully monitoring every day. Someone follows sport events, some people are particularly interested in politics. However, financial and economic news is wildly accepted to be the top priority. Somebody wonders, "Why should I be aware of crises, IMF bailout loans, expansion or contraction of China´s factory output, oil dynamics, and similar things irrelevant to my daily routine?" Is it so important to know trends in the global economy? Or is it wise to know in advance about a looming crisis or recession? Today there are lots of brokerage firms on the forex market. The lion´s share of them are small firms working under a license of a larger broker. As a rule, such companies charge higher service fees or hide their charges behind additional terms and conditions. Moreover, these brokers offer no more than just access to the market. Market experts and savvy traders recommend opting for major companies having not only many years´ experience and large client base but also featuring a well-known brand. This overview is devoted to a broker that fits both requirements InstaForex. Investment attractiveness of various markets is hardly stable. Most often investors favor one or another market or a market segment. However, there is one market that becomes an efficient investment platform when other markets are reeling from illiquidity, or excessive volatility and uncertainty. What type of the market is it? In fact, it is the one that serves all the rest markets providing them with cash. The foreign exchange market is considered a safe investment harbor giving quick capital gains and an intermediate between other markets. But its main feature is flexibility. Forex can be a good investment target, regardless of the political or economic background. Investors can take advantage from it even in crisis times, both in a regional and global scale. Whatever happens in the world, Forex will always respond to all newsworthy events and speculations, thus inviting investors to make some money. However, it is generally admitted that forex trading is not a breeze; it is a hard work, pure and simple. And if you are a person of great ambition, you have to sweat your guts out. Moreover, to start your trading career, you need to find a broker to be your guide, counselor and assistant in the field of foreign exchange investing. With all the abundance of brokers and dealing centers, you should choose from the top 10, at least from the top 20 leading and proven ones. Before approaching to its midpoint, the year of 2014 has already demonstrated an intense economic and political activity worldwide. While some countries are still trying to get through the crisis aftermath; the others are struggling to take control of inflation and GDP playing with the interest rates; still others struggle for the world supremacy. All that cannot but affect the exchange rates, which sometimes lag behind the events, but sometimes anticipate them. Most of analysts and experts are of the opinion that 2014 is going to be a bumpy ride for currencies, or, speaking in professional parlance, it will be a year of volatility. The Fed will continue winding down the stimulus measures; the ECB is likely to cut the benchmark interest rate bringing it into negative territory. Meanwhile, the emerging markets are expected to take drastic action to maintain the economic growth. That guarantees pretty lively and rich year to be continued in terms of speculative maneuvers for the forex market. Getting the full range of services from one provider, supplier, seller, or broker is the most common desire of consumers. In other words, they want to be a part of a certain segment of a market. Of course, the best thing is when a provider offers exclusive, high-quality, and advanced set of services for a fairly reasonable price. Today, a forex trader has to look for the key service - access to the market - at one broker, to watch financial information on a website of some news agency, and to follow forex analyses in various blogs and forums. It is utterly inconvenient to use and manage these resources in one browser, one monitor, and combine all these information in the way it brings a wishful result to a trader helping him to take correct and efficient decisions in trading. For the recent 10 years, the Forex market has been truly considered the most attractive and rapidly evolving financial market for private investors around the world. The currency market is indeed available to everyone who has a few dollars and access to the Internet. All you need is to open a trading account and deposit $5. Voila! You are an eligible private investor operating on the Forex market. However, before you open an account with a random broker or dealing center, it worth spending some hours or even days to pick the right brokerage firm which will enable you to become not only a Forex investor and speculator, but a profit-making trader. The decision to become a trader is not enough. In today´s world, it is getting more and more difficult to live without information about business and politics. In some cases ignorance of politics can be winked at, but being unaware of major financial laws can weigh on efficiency and result in losses not only for companies and households, but also for individuals. Anyway, almost every employed person keeps some savings at home, in a bank, or invests them in various assets. It can be precious metals, shares, and works of art. However, the most popular saving and investment instrument rolled into one is a currency or a basket of currencies. It is crucial to find a reliable broker that can provide solutions for investors with different levels of competence. Through supreme customer service and diverse financial instruments, InstaForex delivers on all counts. When all global financial platforms are easily accessible, you can break new ground in profit-making. From ECN forex to the markets of derivatives and commodities, InstaForex gives free rein to its customers in choosing the most convenient trading instruments and terms. This allows clients to work with classic currency instruments, forex options, shares, indices, and futures CFDs. In addition the company has four types of account tailored to suit each and every trading strategy. This includes cent accounts that can be chosen for small deposits, as the minimum volume equals 0.0001 of a trading lot. To optimise trading and arrange the working process, a trader can set the required leverage individually from 1:1 to 1:1,000. In the saturated market of retail forex, it is not enough to offer a good service. Brokers need to maintain originality to provide the best service possible. World Finance speaks to Vladimir Syrov, Director for Business Development at Instaforex. Through the creation of its PAMM system which allowed traders to manage not just their own funds, but joint capital as well InstaForex managed to position itself within the forex industry in 2009, back when retail forex was still an emerging market. "We were among pioneers," says Vladimir Syrov, Director for Business Development of Instaforex. "It was a case of whatever innovation we brought, we would increase the customers´ base significantly because we were among the first to understand the potential of retail forex, especially in Asia." Instaforex facilitates exactly what its name implies: instant forex trading. The PAMM system permits the transfer of funds under the company´s control to entitle an investor to share in a trader account proportionate to their investment. Forex trading is no longer currency rate speculation. The essence of investment in Forex market has become closer to the conventional idea of investment and even moved beyond its borders. Today anyone having a computer connected to the Internet can either trade on Forex and be responsible for the result or employ experienced and successful traders through the PAMM and ForexCopy systems. Despite both systems are related to money management and Forex market, the trader´s role and the very philosophy of trading differ. What does Instaforex offer? Being registered with the PAMM system, an investor transfers money to the account of a chosen trader and, depending on the efficiency of a trader´s strategy, receives profit exclusive of the commission. After registering with the ForexCopy system, an investor enjoys the opportunity to open the same trades as a chosen trader does. It means that an investor trades on his own yet following the model of a successful trader. Forex has already proved itself as a really independent and effective business platform with a serious approach, of course. Nevertheless, the main advantage of the market is perhaps absolute accessibility of Forex. If you have an electronic device and an access to the Internet, you are a potential trader. And further on, you can be called either a lucky or a non-successful trader, which at first sight will depend only on yourself. However, not only on yourself... In addition to a computer, Internet provider and a wish to trade, it is of high significance to find the right gate to the world of private currency investments, meaning to select a reliable and a respected broker. Forex has not reached the ceiling. It is expanding with regard to key indicators of the market. The number of brokers is enhancing along with the quantity of traders, taking into account not only today´s traders, but also potential ones. It still should be noted that not all companies can fully satisfy the needs of the clients and offer them something worthy. Brokers differ. 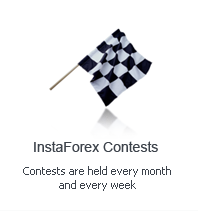 InstaForex equips and educates traders with excellent online instruments for a successful Forex trading. More and more people around the globe prefer investing in Forex. Nevertheless, only a few of them enter the market with professional skills of investing. Forex is mostly considered as something very simple and easy to understand. In a measure it is so, because to get involved in currency trading one needs an electronic device with the access to the Internet, an uploaded trading platform and a certain deposit. However this is enough to begin the journey only, with no respect to the result achieved. To be sure of the outcome, add learning to your experience. Even those who are totally green on Forex realize it, thus driving up the demand for education related to private investments. Find out how you can trade on the market with less time and effort yet take as much profit as experienced traders do. Nowadays information and time cost more than money, so private investors may face a challenge of finding high yield investment solutions that do not take too much time. Though some people associate Forex market with spending a lot of time and effort, modern Forex is ready to offer something completely different. Leading Forex brokers keep pace with not only time and its companion technological process, but also with expectations and needs of traders, regardless of how much effort and money they are ready to spend on it. At present, traders do not have to waste their time in front of the screen waiting for a trend or learning fundamental and technical analyses. Forex market comprises people, a huge number of people, with different levels of knowledge and experience, trading both less and more effectively. At the same time, Forex is a boundless trading floor, a community, or even an organism. If someone is successful on Forex, he can share his knowledge with novices and those who have not succeeded in receiving stable profit yet. Now no one needs to find a Forex guru and try to learn something from him. It is much simpler. Brokers with extended client bases are able to provide their customers with new services of a higher rank. It is not the first year that financial market faces significant challenges: instability, low demand for instruments, and low volatility move from one market segment to another. Corporations cannot guarantee investors stable growth, sovereign bonds and other securities are too long to kindle private investors´ interest while commodity market is too conservative to be attractive during the period when currency instruments are demonstrating profitable for short-term investments oscillations. In fact, instruments demonstrating such fluctuations imply well-liked currency and Forex market which is favored by traders-investors. This market became a real shelter for active private investors especially when investments are regarded as lottery rather than management. InstaForex Company international online broker is well known to a wide circle of traders around the world, and, based on important criteria, it is among the leaders on its market. Having entered the market in 2007, the broker has already been ackoledged by numerous reliable magazines. For example, from 2009 to 2011, British magazine World Finance named InstaForex Company the "Best Broker Asia". CNBC Business, another British magazine, said the company was the most dynamically developing broker in Europe. And the international Forex exhibition ShowFx World twice recognized InstaForex as the best broker on show - at Kuala Lumpur and Singapore financial expositions.